We’re recently getting more and more contracts for coding binary option strategies. Which gives us a slightly bad conscience, since those options are widely understood as a scheme to separate naive traders from their money. And their brokers make indeed no good impression at first look. Some are regulated in Cyprus under a fake address, others are not regulated at all. They spread fabricated stories about huge profits with robots or EAs. They are said to manipulate their price curves for preventing you from winning. And if you still do, some refuse to pay out, and eventually disappear without a trace (but with your money). That’s the stories you hear about binary options brokers. Are binary options nothing but scam? Or do they offer a hidden opportunity that even their brokers are often not aware of? Binary options, in their most common form, are very different to real options. They are a bet that the price of an asset will rise or fall within a given time frame. If you win the bet, the broker pays your stake multiplied with a win payout factor in the 75%..95% range. If you lose, you pay the stake minus a possible loss payout. You’re trading not against the market, but against the broker. The broker needs you to lose, otherwise they would not make any profit. Even if they really pay out your wins, and even if they do not manipulate the price curve, they can still control your profit with their payout factors. So it seems that even if you had a winning system, the broker would just reduce the payout for making sure that you lose in the long run. However this conclusion is a fallacy. It can in fact be of advantage for the broker to offer a payout that allows you to win, as long as most other traders still lose. A broker has not the freedom of arbitrarily reducing the payout. He’s competing with other brokers. But why would you want to trade binary options anyway, when you also can trade serious instruments instead? If you wanted a binary outcome, you can also achieve this by opening a Put or Call Spread with real options – and this with a serious broker, much higher payout factors (even > 100% in some cases) and the possibility to sell the options prematurely. But aside from tax advantages in some countries, there is one single compelling reason that might make a binary options trading experiment worthwhile. Profit and trading cost of a binary option are independent of the time frame. So you can trade on very short time frames, which would be difficult, if not impossible with real options or other financial instruments. You can find a discussion of this problem in the Scalping article. You had to win almost 80% of five-minutes trades – impossible for a trading system under normal conditions unless you enforce that win rate with some tricks, which however won’t help getting in the profit zone. So, smaller trading costs on low time frames are the obvious benefit of trading binary options. With all the side benefits of low time frames, such as more data for backtests, and shorter drawdown periods in live trading. But how can we take advantage of that? There are three problems to solve. Find a strategy with a win rate that is better than the W determined with the above payout formula. But be aware that prices on small time frames are strongly feed dependent. Normally you won’t know your binary broker’s price source (if he has any at all). For being on the safe side, test with different historical price data from different serious brokers (f.i. Oanda or FXCM) and stay some percent points above the minimum W.
Find a way to trade automated. Binary brokers often do not want you to do that. Consequently most do not offer a platform or API for automated trading. But they all have a web interface. So you need either a software tool (such as Zorro) that can send key strokes and mouse clicks to a website, or some other means to get your trades to the broker. Find a broker that’s halfway honest. At least one that allows you to really collect your gains. All binary brokers make it easy to deposit, but some follow the philosophy: “If you gave it to me, it’s mine.” Make test withdrawals before you deposit large amounts. Keep the account balance small. Check the broker’s opportunity to manipulate the price curve: the more customers they have and the more bets they handle, the more difficult is it to manipulate without attracting unwanted attention. Retrieve as many information as possible about your broker: Where are they really located? For some reason, fraudsters seem to be concentrated in Tel Aviv. Check what customers say about that broker – but be aware: positive statements on trader forums are often planted by the broker himself. All those issues make trading binary options sort of “messy”. However it’s the messy methods that sometimes offer the best opportunities. Ed Thorp made his first millions not with ‘serious trading’, but with a Blackjack strategy and with a method to estimate the value of warrants, both also considered messy and hard to calculate at that time. In the C code above we defined an individual objective() function that optimizes the system for binary trading. 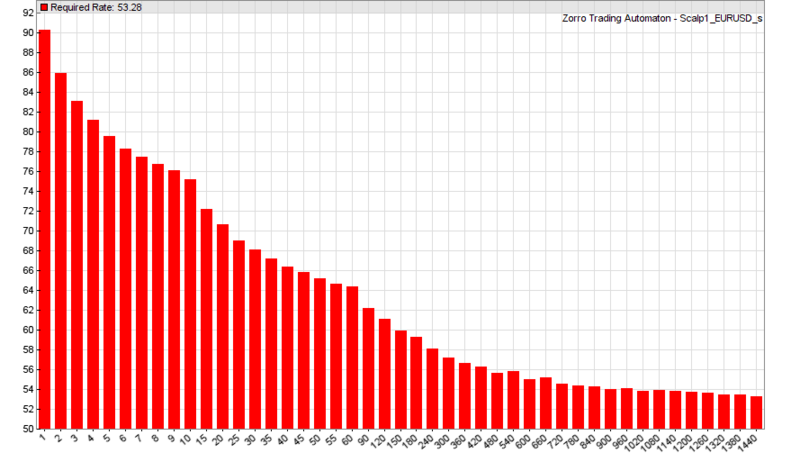 It measures the system performance as the number of winning trades divided by the number of losing trades. Otherwise the optimizer would hunt for the most robust profit factor, which makes no sense for binary trading. The setup establishes a 5 minutes bar period, which is the time frame of our bets. We use 20 WFO cycles and let the optimizer use all CPU cores but one. This way the training run takes about 5-10 minutes for 5 years data. The BINARY flag activates binary trades, and we’re simulating a broker with 85% win payout and no loss payout. With the same trades we have now only 40% win rate and an overall loss, since all the trade profit is eaten up by spread and commission. Start the script, and wait until the broker’s website pops up in your browser. Then follow the instructions in Zorro’s message window. Manoever the mouse onto the “Buy” button and hit the right mouse key. Then do the same with the “Sell” button. The script will store the button positions and then use the keys function to send test clicks to both positions of the active window. 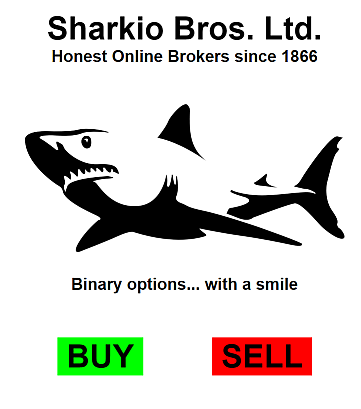 For testing purposes I’ve imitated a typical binary broker’s trading platform. You now only need to glue together your trading script with the button clicking script, and adapt the latter to the website of your broker. This is left as an exercise to the reader. And better use improved versions – the scripts here are kept simple for demonstration purposes. As long as the script trades, make sure that the browser window stays in the foreground, or else it can not click on the buttons. For the position size, either enter a fixed size for all positions, or let your script click into the size field and send key strokes to set individual sizes. Of course I don’t want to recommend a particular binary options broker. In the end, they’re all crooks – but some are crookier than others. Finding a suited broker is, also, left as an exercise to the reader. Binary broker comparison websites are often – surprise, surprise – installed and paid by binary brokers. US citizens are normally not allowed to trade binary options with brokers that are not regulated in the US. Some brokers will accept your deposit nevertheless, but use that as pretext to refuse payout. If you’re a citizen of Israel, you might not be accepted by many binary brokers since they’re not allowed to fraud compatriots. It’s often the “messy” and despised trade instruments that can still provide opportunities when they are correctly understood. I’ve uploaded the two scripts to the 2016 repository. You’ll need Zorro 1.52 or above for running them. When you now make huge profits with binary options, don’t forget where the money comes from: Not from the broker, but from his less fortunate customers that maybe just haven’t read the right blog. Thank you for this article. Would you happen to know of any software out there, or a model, that cap produce a binary risk curve over time? Similar to the risk graphs created by traditional options software? I found one on Wolfram but I can’t change the security prices. It would be very helpful for me to understand binary prices over time and volatility levels. I don’t know such a software for binary options, but you could probably calculate the graph with the standard Black-Scholes algorithm, just as for a normal European option. The question is only what you would do with this information, since you can normally not sell a binary option during its lifetime. I have an account at Nadex and you can buy and sell them (close out a position). So I would be helpful for me to mode out the possible prices over time. I bought your book recently and really liked it. Lots of great ideas for trading algos. I’m glad I understand some German. I’m a complete newbie to binaries, so please forgive my ignorance. You say that the trading cost does almost not depend on the the time frame. Obviously, when you put on a lot of trades in a short time, the expected profit is usually small, so it can easily get eaten up by commissions. As far as I understand, the payout of a binary is fixed, so it is always the same whether your trades last 1sec or 1000secs, which makes it in some sense time-independent. However, (and this is where I’m a bit green still), binaries have a fixed expiry date, so our profits are in some sense bound to the time to expiry and get smaller the closer our trade entry get to it. On the other hand, the closer we get to expiry, our probability of reaching a certain target price increases as the path divergence from spot to expiry gets smaller. So, in my naive understanding, the algo you presented above should only work optimal for a given time in the day that is n periods away from expiry. I’m probably wrong but I would like to hear your opinion of why this is not the case. PS, I think it should be fairly easy to model binary options with Monte Carlo rather than Black Scholes, as it is easy to put all sorts of constraints in it. I’ve done this with Barrier Options, it’s slower but quite effective. @ Jeremy, Tom: I had not heard of Nadex before, but they indeed allow to exit an option before it expires. This article was only about the usual options with a fixed duration and costs independent of duration, but exiting options opens new interesting possibilities. A risk graph makes then a lot of sense. Maybe that could be the topic of another article. – @ Gonzatti: Yes, I’ll translate it when I find the time. Informative and entertaining as ever. Many thanks. Jeremy, Tom – thanks re Nadex. Interesting. hi, very interesting article, me too have an account at Nadex. and they have a very good and and informative site with huge amount of info. could u check their platform and how we can use this platform with Zorro app. From what I see, Nadex seems not to provide a direct connection. So you would need a script like above under “Step 2” or some similar solution for controlling their trade platform. Thank You for this informative contribution. The expiration time of the option may no doubt also be an interesting parameter to look at, although it is very broker specific what it can be set at. I have been trying to exploit this additional parameter, since in zorro there is the possibility of adjusting the ExitTime from the BarPeriod to some other value (I inserted after “LossPayout = 0;” simply ExitTime = 15; for instance). Surprisingly, if I do so with the above script the test result is always the same which can certainly not be correct. Why does this fail? Because your ExitTime is overridden by the LifeTime setting. You can use either ExitTime or LifeTime for the duration of a trade, but the recommended method is LifeTime. – You can find those issues by looking in the logfile. There you can see how long the trades last and which profit they make. GoMarkets has binary options on their MT4 platform, trading from your normal account. I think there are a few other’s out there too. Yes. Some brokers provide binary options through the FX LITE MT4 plugin. You can then trade directly with Zorro through the MT4 bridge and need no button click function. Only the time frame of the bet must be set up – as far as I know – in the order comment field. Probably via lot size, but I found no detailed documentation. I’ll inquire with the developer of the FX LITE tool. “Size” is the position size in units of the broker’s minimum size, like 1$. “BO Exp:” sets the duration in seconds. If you want to change the position size on the broker’s web interface, it’s just as with clicking the buttons: let the script click into the size field and then send key strokes for setting the size. Great & interesting example Johann – thanks for sharing. Also, some binary options brokers (like IG Index) quote a threshold price which is their prediction of where the market price will be in 5 mins. Our algorithm needs to determine whether the market price is likely to be higher/lower than the broker’s own estimate on expiry (not the market price when the bet is placed). This is hard. The close is used by Zorro. The mean would be wrong since it’s no real price. However 5-minutes data is highly feed dependent, and you will likely get different results with different brokers. Zorro uses FXCM price data by default, but it’s better when you backtest with price data from the very broker you trade with. It’s interesting how many variants of price bets are offered by binary brokers meanwhile. Using a predicted threshold would effectively prevent an algorithmic system since you can not backtest it. “Undeclared identifier” means that your software does not understand what you’re typing. Either your version is too old or you did not type it right. This blog is not really a good place for programming support, but the user forum is. There you can also get the newest version. I found binary.com has an API trading interface. Maybe we can expect Zorro will have ability to trade binaries ? A rare pearl in the sea of binary option articles! I also like a lot the general approach to trading you and the community of Zorro have. Kudos to you! and got a suspiciously higher winning percentage. As I think this is not because of a real improvement of the strategy performance, what is the reason for that? Is there a way to place a (binary) trade – talking about training and testing mode – before all other trades expires? The “< 3" opens more trades, every time when an entry condition is met while the previous trade is still open. The higher winning percentage is probably mostly a random effect, but there could be also a real improvement when many additional trades fall into a mean reverting market regime. For even more trades, you could use a 1-minute bar period and run several five-minutes-trades opened on different bars in parallel. But for backtesting this I would recommend tick data. M1 data becomes unreliable on small bar periods. Thanks for the quick reply. I played around further with the script, and noticed an important fact to be taken into account in Zorro when simulating binary options strategies. When selecting a LifeTime much higher than 1 bar, and allowing placing positions when other positions are already open, you will notice that something odd is going on. You may get incredible (but unfortunately wrong…) results, that being due to the fact that by default Zorro closes a trade when another trade on the opposite direction is placed, assigning it a win or a loss depending on the situation at the moment (thus without taking into account the expiry time fixed by LifeTime). I think this is a “bug”, in the sense that Zorro should not behave like that when the the BINARY flag is set. I ‘solved’ the problem setting Hedge to 2, which allows to enter and open long and short positions simultaneously. Maybe this setting of Hedge to 2 should be executed automatically by the program when the BINARY flag is set, in order to avoid wrong simulation outcomes. Yes. When more than one trade can be open, Hedge must be set to prevent closing a position by opening opposite ones. Otherwise you could prematurely exit from your bet and book the profit! – This is not automatic, so the consequence of any setting must be carefully considered for emulating binary trading. I have some real experience with autotrading binary options. I built an interface for Newstrading. I used Forex News Gun and rent a server in New York, which put me in the position of executing a trade within 1ms once fundamental indicators are published. It’s an unbeatable system if you take your time to study how the market reacts to the data. I had 80+% winning rate and with the optimal risk (Kelly Formula!) I should be a millionaire by now! However, once brokers realize what’s going on, they block you out with error messages. I would highly recommend to learn how to apply fundamental analysis and how to trade manually instead of spending any energy on binary options because of my own experience. I spent like 2000€ for server rent, deposits I never got back (beware – 24option takes 80 units every month from you account if you don’t trade several month. StockPair does this as well), Winautomation Pro, and a custom coded strategy (was one of the customers JCL spoke about – it is possible to beat 57% winning ratio but it’s really hard with technical analysis only! I don’t think it’s possible to beat break even really significantly, so forget about getting rich quick). However, I managed to build a somewhat stable autotrading interface with Winautomation. If you are interested, I’m willing to share my code, but it will need adaptions for your broker. Nice article, I will play with this code the next time I’m bored. I’m sdh309795gaas in the Zorro forum. Would anyone be interested in working together on some of this stuff? I’ve written an nodeJS API for iqoption, along with a backtester that allows the algorithm to be dropped right into the API without any modification, but I’m still trying to figure out the price prediction part. This strategy gets about 55-57% accuracy when I tested it with the data from iq option. But when you factor in the changing profit rates and everything, there’s just not a whole lot of trades left. how can I get the script or apply the auto robot to trade for me with a good broker like binary.com ? Please guys – I work at the sharp end of the financial industry- these can best be likened to a roulette wheel with a slower time to burn than through your chips. Unless there has been some new market news the price fluctuations cannot be predicted on a five minute interval. Some of the finest on Wall Street make only 75% profitable decisions. The have access to non-public research, 20 years experience, teams of analysts using supercomputers crunching millions of transactions, financial capital (billions) and brokers that work for them. Thankfully they only need to be right on very specific transactions. You don’t give money to Nigerian scammers, why let someone take your money on binary options???? I had $5000US dollars deducted from my visa to Optionbot 3.0. But I have not heard back from the company or from my broker who had promised me that by investing I would make a very good profit. Unfortunately I only received 1 call from my broker who set up some sort of auto trade and was told specifically not to touch it, which of course I haven’t. The problem is that now I lost all my money and I cannot reach them either. I am writing this post because one broker named John, from such called: Optionbot 3.0 called me on 25 June of 2016 and forced me to open an account on their website http://www.optionbot.net promissing me that Optionbot will make 100% PROFIT of my deposits. I transferred that day 10 000 Euro by Credit Card. The broker took over my account and started trading. After half an hour, the margin level was under threat and I received a call and broker started to ask for more money. I sent another 5 000 Euro from my Credit Card! On 30 June, he opened 11 wrong positions with a huge loss and I woke up with all my money lost. I instantly called my broker and this criminal which burned all my money said that he will refund all my positions and I will succed to withdrawal all my money. I waited for few hours and tryied to call John, and he never asked. Days passed away, I was trying and trying to call him, to write to his email, but without answers. I want to catch this broker which robbed my money, and made hundred of trades on my behalf without my consent and to punish him for every EUR that he lost, to punish him piece with piece just to understand how hard is to make money. I wished I have read this article before I parted with my 250US dollars with BDB. Scammers really were able to convince me by calling me long distance from Cyprus. i think he’s trying to scam a lot of people, he made it very good and authentic. This is such a great post in which Binary Options scam is describe in a better way. I am seeking this type of blog from so many days but today i am glad to find this blog. I have been trading binary options with this script on live/demo accounts since Dec. on auto pilot with two brokers. It seems on some days it works really well and on other days it’s the opposite. The end result is, it’s struggling to break even. Love to work with someone to improve this. Let me know if you guys are interested. It’s all good and well to say that you are succeeding as a trader when your account balance is rising and trades seem to be going well. But I’m wondering if anyone here has managed to withdraw any actual cash from binary trading accounts? Things were going really well for me and I believed I had found a quick path to success when I started trading and winning. But, when I needed to liquidize my funds, it was impossible. Has anyone been successful in getting money out? I have been contacted by a legal team who has informed me that the binary company I invested with will not ever give me my money unless I open a case against them, so I am thinking of doing this. Does anyone have any experience / advise about this? If your binary broker refuses to pay out, the first problem is that you normally do not know their real address, not even their country. So the chance to get your money back from a Cyprus mailbox is zero. But in the orbit of fraudulent brokers, a whole industry of “legal teams” or “hackers” have established that promise retrieving your money for a fee. You’re then not only losing your investment, you’re losing that fee as well. Sometimes the “legal team” or the “hacker” is the broker himself when they smell that their client has still some money left. At least that’s what I’ve heard about those services. What I so far never heard is that someone really retrieved money from a fraudulent binary broker. This is just a quick & dirty example, there might be better methods. ensure that it is more effective for everyone. Thanks for the whole write up. Looking forward to getting more information on you manage everything regarding money management, legal issues and other things to get things fancy and manageable. Binary options is really not for all. It always bears a lot of risks. This kind of information will help the enthusiasts escaping the bad things. Regards. Thanks for a fascinating article. Regarding trading costs on short term binary systems….commission doesn’t factor in however can you comment if slippage affects the results of this system? I came up with an automated binary options system that trades 650 times/day and backtests in MultiCharts at a 76% win rate (39.5% payout) — which “on paper” is profitable. However slippage brings the real world results down to roughly 70%, making it a marginal loser. Is this the same with your system? In binary trading, slippage largely depends on the honesty of the broker. Since they are usually market makers, it is no problem for them to generate artificial slippage for reducing the win rate. So it may be worth the effort to test the slippage and compare it with different brokers. In serious trading, slippage has a smaller effect on the win rate since asymmetric slippage is illegal under most regulations. Would this system benefit from applying your MMI as a filter? Not really, since it’s using mean reversion. MMI can detect trend regimes, but makes no difference between mean reversion and pure randomness. Hi jcl…ahhhh sorry I missed that part in the MMI article where you said just that. Sorry about that. Ok, just as a follow up though, let’s assume as you imply that there are 3 modes, trending, mean reverting and random. Obviously the mean reversion system is not going to perform well in a trending market or in a random market…however if your MMI eliminates trades during trending periods, would that not at least be partly helpful in filtering out some of the losing trades? If not, do you know of a method to differentiate a mean reverting mode? ADX is supposed to be effective, however I’ve never had much luck with it in actual system testing. Last question…is your book available in English? Love your blog! Yes, there are other methods to detect the market regime, often used is the Hurst exponent. I have already on my to do list a series of experiments to find out which detection method works best under which circumstances. FrankyB….pretty sure the only legal way to trade binaries in the US is with Nadex. It’s an SEC regulated exchange though so totally safe unlike most other binary brokers. I’m pretty sure there you’re trading against other market participants rather than against any broker. Glad to find somebody who takes a realistic approach to binary options trading. I believe that profiable strategies can be automated, but they are not available in the public domain. Because when you have a profitable strategy, you trade it and make money, you don’t share it with everyone, especially not for free. Unfortunately there are hundreds of scam systems (see warnings at https://thebestbinaryoptionsbrokers.net/category/binary-options-scam-2) that try to make people believe the contrary. And I see a lot of people fall into these traps, they still believe that somebody will make them money for free. Cool overview. At the end of the day, Binary Options, FRO (Fast Return Options) all derive from various interpretations of the B&S formula and are indeed financial instruments. Sophistication is the basic element of fraud and if you look into HFT there’re a lot of questions and I remember a movie with Haim Bodek talking about weird weird stuff. jcl…does this system enter on the open of a bar or intra-bar if the price hits your pre-defined level? jcl…I’m wondering if I could get your opinion on something. Do you think it is possible, using data mining, that someone could discover reliable repeating patterns in a data series generated by a cryptographically secure pseudorandom number generator that is programmed to behave like a real market? Not talking about cracking it or finding the seed, just patterns that repeat leading to higher or lower prices over a specified timeframe. Or is this a hopeless endeavour? If it is a random number generator, then it has per definitionem no reliable repeating patterns. Otherwise it would be a bad programmed random number generator. So I would think they must have some deterministic algorithm that makes the numbers a little less than random. For instance, volatility in these “fake” markets seems to exhibit mean reverting tendencies similar to the way it does in real markets. I wonder if that is by accident or design? There are many ways to simulate a market, the simplest is using real market data. So I don’t know for what purpose binary.com uses a random number generator, and in which way it is programmed. Since it is a binary broker, I would assume that it is programmed to maximize the user’s losses. This means the generated index depends on how many users bet on rising and how many on falling. Since this info is known only to the broker, you can not use it to your advantage. Hello everyone, I’m looking to get into trading in this way but would like to read jcl’s book first. Could someone help me out with a link? Dear recovery scammers, I have to inform you that those comments don’t even make it to the website, they are filtered away early. Better save your time and do something useful for mankind. Thank you! In light of the heat the binary options industry is receiving at the moment (EU/UK ESMA ban etc), your article provides perhaps the most balanced analysis of the pros and cons we have seen. Great article and we intend to reference it in an upcoming piece on our site ThePayout. Some Forex Brokers offer Binary Options on there MT4 platform – I understand. Could ‘we’ link to Zorro via MT4 and hence to Binary Options ? Sure. The lifetime is coded in the MT4 ordertext. jcl, i am zero at programing, I would like to try this script at iqoption. i tried join both scripts together to click on iqoption but no avail. iq option also needs us to select each click time also for 5 minutes, could you please help me with gluing the script together click effectively on iqoption? As you probably found, “glue together” is an euphemism. It’s a bit more work to do. My first advice is that you learn programming. There’s a short tutorial in the Zorro manual. If you don’t want to learn, the alternative is that you pay. Op group develops and glues together all sorts of scripts on client specifications. You can contact them under info(at)opgroup.de. Really awesome read right here.. I have a little knowledge in programming in pinescript(tradingview). And made some codes that I could translate in zorro, just need to learn the language more. Really want to apply some ideas that you’ve published in some of your blogs. Hope you could share more!